Don’t be surprised if your eyes cross as you look at this thing. Before you can understand how BSE fared, you have to learn exactly what the report card measures. Let’s break it down for you. The whole school doesn’t take these tests. Third through fifth grades take the Smarter Balance each spring. The fifth grade also takes the OAKs Science test. These are last spring’s scores, coming out this fall. Smarter Balance looks a lot different than the standardized tests we grew up with. According to Janet, the Smarter Balance is actually very similar to what students already do in the classroom, meaning teachers don’t really need to “teach to the test.” The test measures a student’s ability to draw conclusions, predict, and identify evidence in the text. However, the science portion is a separate test taken through OAKS, which aligns with state standards. Schools are not rated by just their test scores. Gone are the days where schools were simply rated based on their average test scores (like when we were kids). In hindsight, that system favored communities that ALREADY HAD a high-achieving student population, full of kids who went to preschool and were economically stable. Comparing academic achievement of a Title I school (with a high majority of students in poverty) to schools in a high economic bracket is comparing apples to oranges. These days, Oregon compares its schools to other “like schools” to give a more accurate picture of how a school is performing. It’s essentially a peer school-- one that’s similar in size, demographics, and socio-economics. Bonny Slope is being compared to schools that look and feel a lot like us. The report card also compares subgroups. Instead of just test scores, the state report card also measures student growth. Ah, so this is where it gets tricky. Not only is BSE being compared to similar schools, but now our children are being compared to their academic peers– and that takes a few years of data to measure. Imagine a student who scores in the 50th percentile in 4th grade. They take the smarter balance test again in 5th grade. Instead of just lumping all the student scores into one average (and then gauging against all other schools), now this particular 5th grader’s score is compared to THE OTHER KIDS WHO SCORED IN THE 50TH PERCENTILE IN 4TH GRADE– his academic peers. Is his progress the same or better? Has your head exploded yet? Same. That measure-- or STUDENT GROWTH– as they say in educator circles, is what counts. They take one or two years as a baseline for academic prowess, then watch to see if those same students continue to achieve at the same level compared to those academic peers. So after all that, we’re happy to report that Bonny Slope nailed it. In every category, BSE performed better than “like schools.” WHOOP! Our science scores also improved from last year and the ELL scores (English Language Learners) were celebrated at BSD central. 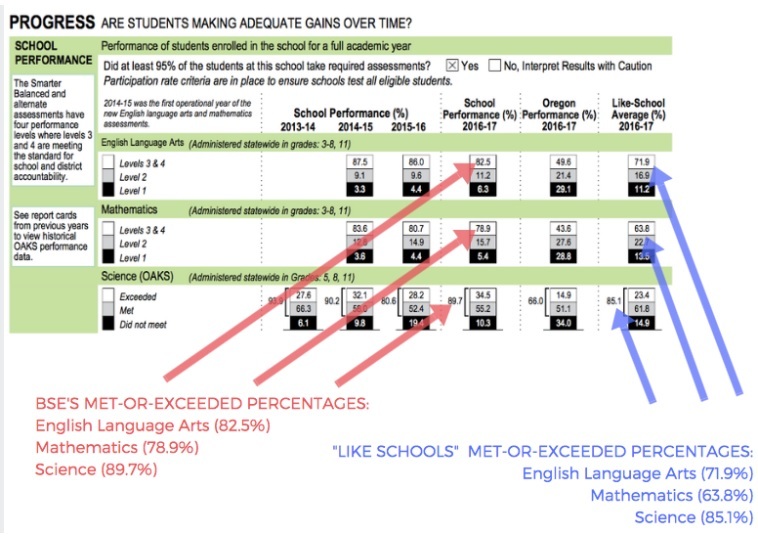 Nearly every single subgroup outperformed their “like school” counterparts. Parents are allowed to use a religious exemption to opt-out of vaccines. Our secretaries have a brand-new responsibility-- pushing a button! Every five seconds! Oh, and the school locks automatically at times that don’t coincide with Student Stop hours. Brilliant. Just brilliant. Needless to say, the new current security measures are still a work in progress. The preschool is still a go for January. Bonny Slope will be a pilot project for non-title I schools. The funding for this new adventure comes from several sources. Next step-- furniture shopping! And that’s a wrap. Join us on Monday, 11/27 at 2pm for the next riveting Principal Chat, which will also include a Special Session Community Meeting. We will be learning more about the planned fifth grade trip to Mazama Science School and vote on an additional $2500 to fund this endeavor. More info can be found here.